Over the last few years I have been working to streamline my corsets. I want to make them as delicate as possible while still allowing them to shape the body, and react to its shape and movement. Experimenting and engineering corsetry for flexibility and lightness has been occupying me for some time. When I first started making corsets and testing materials I had never heard of coutil (the tightly woven herringbone fabric favored by corsetmakers) and had never seen a corset of any kind in person, much less an antique. 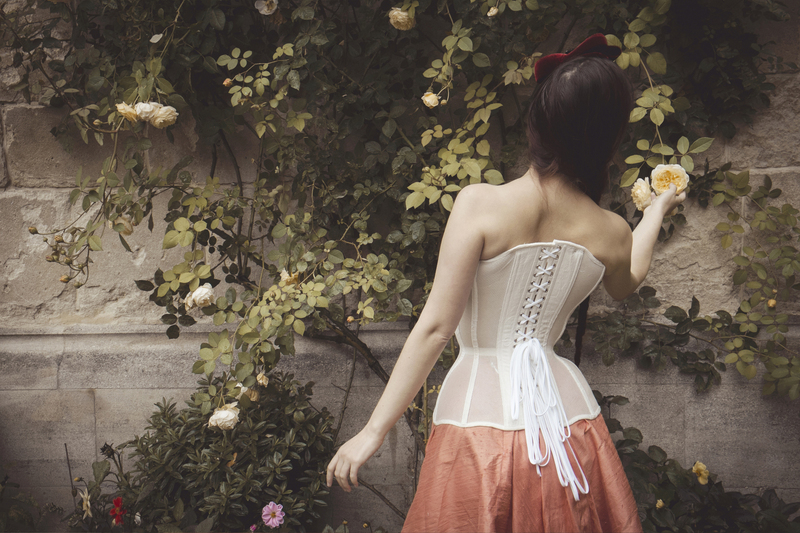 Like others I believed that corsets were inherently heavy and rigid. 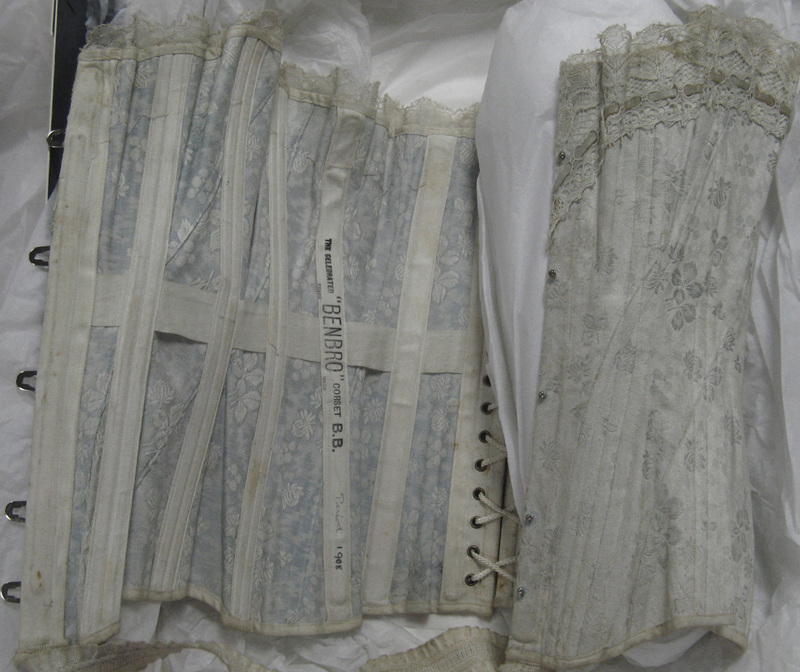 It was quite a revelation to hold a light airy antique corset for the first time. Slight and pretty, the most fascinating were not at all the stiff monsters of our imaginations. Everything about them was tiny. The stitching, the eyelets, the herringbone weave; they were delicately sculptural and imperfectly perfect. While I don’t feel compelled to make reproductions of fashions past; looking at, touching a range of antiques has informed my corsetry ever since. The lightest, most airy of my experiments to this point is an English cotton bobbinet corset. In some ways it has all come back in full circle. Some of my first dabbling in corsetry involved creating steel boned corselets to support gowns and experimental art to wear. Along the way I discovered that bobbinet was the choice material for creating the inner structures of couture gowns and began to use it myself with lovely results. Julia Bremble has a fantastic spotlight of this beautiful net in her Sew Curvy blog if you’d like to learn more about it. Finally, after thinking about it for years, I decided to make a full blown corset out of this exquisite material. 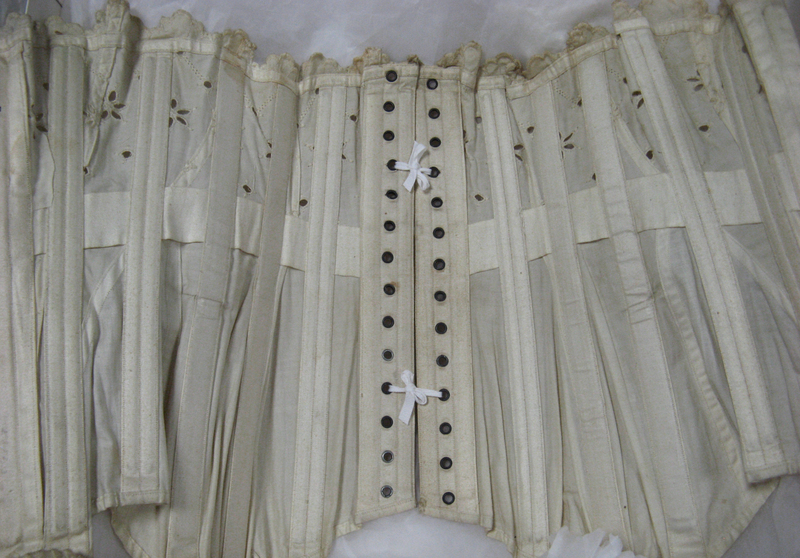 The main corset is made from the bobbinet, while the boning channels and eyelet panel are made from floral linen. I love the look of sheer corsetry but find the nylon net most commonly used, too warm and synthetic feeling to wear directly against the skin. This sheer cotton corset however perfect as an underwear piece to fit under a wedding dress or gown as it is inconspicuous under clothing. It is steel boned, mostly with spiral steels, and while it is supportive and it reveals the shape and form the wearer. It is flexible and bends with the body more that fabric or nylon mesh corsets, so if a very solid, unyielding silhouette is desired a more stable material should be used. Ideally a corset in this material would be custom made and take account to the variations of the individual body shaping, “squish” and breast tissue density. I’m curious to test a heavily boned version in the future. I see some experimenting needs to be done to account for the give and take of the net along with a great deal more testing of its durability and tight-lacing capabilities, but overall I’m thrilled at the results. I’ll leave you with one more image of Victoria Dagger wearing the bobbinet corset and Morúa velvet cocktail hat. This set was taken by Jenni of Sparklewren on a perfectly rainy English morning the day after the Oxford Conference of Corsetry at Jesus College. I am lucky to have such talented friends and colleagues.